FV #23 - What Percent Are You? Ok, I'm a bit fascinated by the OccupyDC and OccupyWallStreet protests. Of course, one of the underlying causes is rooted in the feelings of greed and corruption by the affectionately named 1% to me (and probably you) over here in the 99%. So, in the spirit of this, today's visuals are all about money. As always, enjoy. This visual is simple. 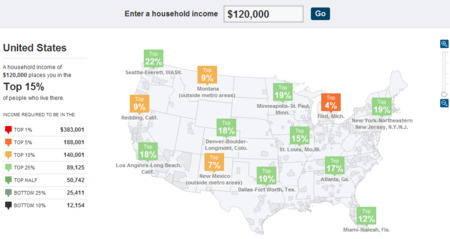 Enter your income and see your (relative) percent from regions all over the United States. I used average teacher salaries in my example - I used twice the highest average salary (California at $59,825) to simulate a teaching couple). As you can see, a household income of $120,000 gets you into the top 15% nationwide. Fortunately, this map allows you to drill down a bit into your neck of the woods. I live outside of Washington, DC and so $120,000 drops you into the top 33% category. Moving a couple of hours away into West Virginia, you'd get up to 7%. Poor, devastated Flint, Michigan would up you to the top 4%. Anyway, play around with the tool, enter additional incomes. It's amazing to me that $500,000/year doesn't even get you into the top 1% in some parts of the US. The rich-poor discrepancies in this country are really something. This tool would be great to use when facilitating a discussion about the Occupy Wall Street movement. I also think that it could be a nice device to use when talking about the value of money. There has to be some math activities possible as well, right? Just talking about how outliers really throw off averages could be of value, and we all know how statistics can be used to nefarious ends. Ok, so there are some rich households out there. What do all these people do for a living? 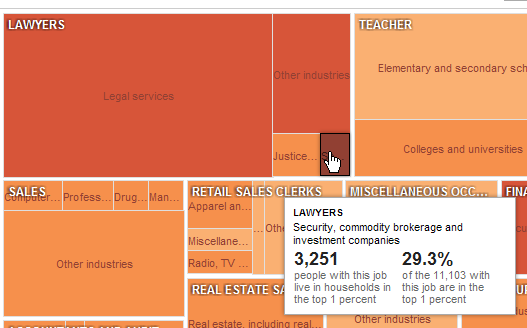 Well, this next visual lets you know that... but it also uses color to let you know how many people in specific job fields are in the top 1%. 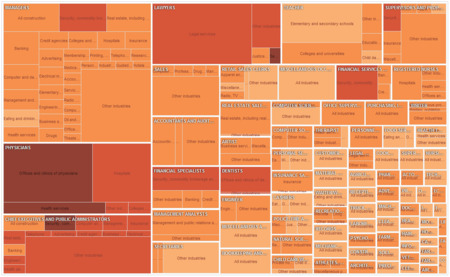 Also, the size of each box indicates the number of people in those positions at the very top income level. Lots of information presented visually. Very slick. Sweet. We're poor, we got it (but some of us were smart enough to marry up)! Use the Zoom In, Zoom Out and Full Screen options to really give this chart a good look through. It's interesting. January 20, 2012 by Brett Sparrgrove.